I am deep into the adventure of Stirring, the second installment of The Emblem and The Lantern, having completed eighteen chapters and presently working through the next. 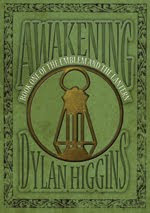 As with Awakening the new book has taken many turns that I as the author didn't initially intend. Its funny to say but sometimes I feel like I'm reading the book rather than writing it! I suppose that's how inspiration works sometimes. When I began the Stirring I didn't have as clear an idea of how many chapters it would contain unlike with the first book. Now that I'm nearly twenty chapters in I can confidently say that I'll top thirty, making it at least a fourth longer than part one. Having already established the lands and characters in Awakening it has been enjoyable to delve deeper into the heroes lives and thoughts without spending much time setting up things like was necessary with the book one. What I'm really trying to say is that I feel like part two jumps right into the thick of things! I can't wait to be finished and share Ethan and Eisley's continued adventures with you!